On Independence Day weekend, the Connecticut Convention Center was crowded with thousands of American Muslims. The annual ICNA-MAS Convention, one of the largest Muslim events in America, is organized by the Islamic Circle of North America (ICNA) and the Muslim American Society (MAS). ICNA is an Islamic grassroots organization that works to, “seek the pleasure of Allah [God]…through the struggle of Iqamat-ud-Deen (establishment of the Islamic system of life).” MAS is similarly, “a charitable, religious, social, cultural, and educational, not-for-profit organization,” that “uplifts…society” through “Islamic revival.” The proceedings planned by ICNA and MAS took place in Hartford from June 30th to July 2nd. Those who attended the convention came from across the country to learn more about Islam from scholars and activists, to improve themselves as individuals, and to make new friends and meet old ones. 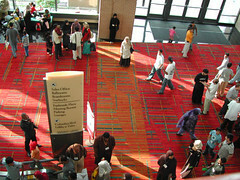 Nasim, a mother of two with a Pakistani background, also emphasized that she wanted to attend the convention with her two sons so that they “know we are Muslims.” Asiyah, a woman coming from a small city in Connecticut with an Egyptian background, similarly stated that one of the major appeals for her was the “renewal of identity” that she experiences when she is surrounded by other Muslims. While the majority of participants were of Pakistani and African American background, the ethnic diversity of Muslims was nevertheless vast. The main language in use throughout the program was English, but sessions were also held in other languages including Urdu, Bosnian, Indonesian and Turkish. Most of those who attended came with their family or friends and many who came this year had also been participants in previous years. There were lectures for everyone on topics ranging from parenting to Islamic financing and self-development. The first two days of the event also included sessions designed specifically for women such as a quiz competition and a discussion on how to achieve success in one’s marriage. In addition to ongoing simultaneous lectures, there was food, a bazaar and entertainment by renowned Muslim artists such as Zain Bikha, a South African nasheed (Islamic song) artist, and Native Deen, an American Muslim hip-hop group. A parallel youth conference, organized by the Youth Department of MAS and the Muslim Students Association, took place as well. The weekend’s events began with a khutba (sermon) followed by the jummah prayer (congregational Friday prayers). The khateeb (the person delivering the sermon) recited a Qur’anic injunction and then translated from Arabic to English: “O Mankind, We created you from a single (pair) of a male and a female and made you into nations and tribes, that you may know each other.” The khateeb then proceeded to explain the important meaning of these words and how the principles behind these words apply to everyday contemporary life in America. He made it clear that Islam does not differentiate between people based on class, race, caste, etc. Living Islam means treating your neighbours (metaphorically understood as all those with whom one interacts) with respect, no matter whether they are male or female and no matter their religion. Living Islam means showing love to all human beings, without discrimination, the khateeb preached. The theme for this year’s convention, ‘Living Islam, Loving Humanity’, holds a great deal of significance. Dr. Khurshid Khan, Ameer (president) of ICNA, articulated the rationale behind this theme: “At a time when people around us are confused about what the real face of Islam is, conveying the right message is critical and, in fact, obligatory upon us [as Muslims].” Undoubtedly, the convention’s theme is not only a message encouraging Muslims to shun isolationism, but also a message to the wider American public in order to promote a better understanding of Islam in the face of Islamophobia. Participants were generally aware of the significance of this message. When discussing popular American perceptions of Islam, one participant exclaimed that, “We have to prove to them we are good people.” Similarly, one young woman named Sahar Afi Abdur-Rahman of African American descent told me that she is concerned about the future of any children she may have in America. My only real concern today is not necessarily for my future but my children’s future. What will their life be like? What will be the repercussions? It’s so important how open we are and how much we get out and show people our Islam. Because otherwise, our children will face the repercussions for that. They are facing them already. So it is within this context that love for humanity was emphasized. At the opening address, Dr. Khan cited Prophet Muhammad (peace be upon him) as an example of an individual who loved humanity and urged fellow Muslims to do more than simply follow the five pillars of Islam. Likewise, Imam Zaid Shakir, a renowned Muslim scholar, said that, “You cannot live Islam without loving humanity.” He went on further to say that, “Love is a big part of Islam,” and that, “We have to dare to love humanity.” In another lecture targeted at youth, Altaf Hussain advised youth to make well thought-out and meaningful contributions to society. He asked young members of the community what their contributions would be: “Will you join Amnesty International? Will you run for Council?” Civic engagement was one way that speakers recommended participants demonstrate their love for humanity. Many participants thought the Civil Rights and Media lecture series was particularly relevant and appropriate for today’s American Muslim community. Among the speakers discussing this topic were members of the American Muslim Taskforce (AMT), former United States Army chaplain Yusuf Yee and journalist Amy Goodman. The AMT is an umbrella organization that seeks to, “Defend civil and human rights of all” and empower American Muslims through the democratic process. As a representative of the AMT, Imam Mahdi Bray noted that there are relatively large amounts of funding being directed towards building masjids (mosques), but little money in comparison being used to protect those that pray in these same masjids. With this fact in mind, he called for increased funds and activism focused on protecting the civil rights of Muslims. In calling for increased activism, he pointed to the link between the spiritual and civic components of life. Chaplain Yusuf Yee also spoke about the need for political activism. He was a former United States Army chaplain who served at Guantanamo Bay detainment camp until he was criminally charged with five offenses by the American government, including aiding the enemy and spying. He was held for 76 days in solitary confinement and then his charges were mysteriously dropped and he was released without apology. Yee similarly urged fellow American Muslims to stand up for civil and human rights for the sake of humanity at large. His stance was that this is the duty of all Muslims. Amy Goodman was another captivating speaker. As an American broadcast journalist and author, she spoke about the importance of independent media. She criticized the American media as acting “unforgivably” before the Iraq war by silencing opponents of the war. “The Pentagon has deployed the media and we have to take it back,” she said. Goodman explained that the role of the media should be one of “building bridges” and instructed the audience: “Your job is to support a media that exposes what is not the best of America…anything less than that [independent media] is a disservice to a democratic society.” There was applause during her speech and people shouted Allah hu Akbar (God is great) to show their approval. Indeed, the audience seemed to agree with the need to advocate for a more just society through nonviolent activism. The convention’s theme emphasizing love for humanity worked to encourage an expansive notion of community, one that went further than just the ummah (Muslim community) and encompassed America as well as people of different religions globally. So in addition to the call for political activism in an American context, there was also a call for increased interfaith dialogue and an expanded concept of service to reflect the love for humanity that is part of Islam. At an interfaith dinner, held on the first evening of the convention, various representatives from different religions were present, including figures such as Rev. Stephen J. Sidorak of the Christian Conference of Connecticut and Heidi Hadsell of Hartford Seminary. Together, they discussed the need for increased understanding and cooperation among religious groups in America and the need to work and live peacefully with people of all faiths and with humanity at large. Ingrid Mattson, an acclaimed scholar of Islam and the Vice President of the Islamic Society of North America (which supports the Muslim community in North America and works to promote healthy relationships with other religious groups), added to the discussion an acknowledgement of the obstacles in achieving this sort of harmony between people and identified the need at times for a “leap of faith” when engaging in dialogue with members of different religious communities. The participants also recognized the need for practical action and project ideas were brought forth such as an interfaith program to combat youth violence in Hartford. As this interfaith program proposal reflects, many religions attach a strong value to community service and this can often be a force that brings people of different faiths together. Speakers at the convention urged American Muslims to envision a broader concept of service that includes helping those outside of the ummah. One speaker gave the example that if someone is hungry, one should not share food because they are Muslim, but rather, because they are human. The message was clear: part of loving humanity means serving humanity, and not only Muslims. This message tied very closely with an issue on the minds of many – integration. Another prominent theme that repeatedly surfaced in the lectures of many speakers related to the need for Muslim integration in America. The extremes of isolationism and assimilation were both criticized. 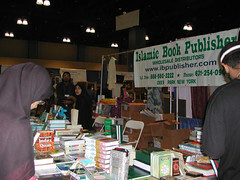 Isolationism was discouraged through the emphasis on ‘Living Islam, Loving Humanity’ and assimilation, or the decline of Muslim identity, was discouraged not only directly through lectures but also through the strong sense of pride in Islam that served as the backdrop for this convention. While there seemed to be almost unanimous approval on some topics of discussion at the convention, there also existed some less obvious divides within the community. For example, there were differences in perspectives and interpretations of Islam. One participant voiced some discomfort with the term ‘revert’, used by some speakers at the convention to refer to people who have chosen to embrace Islam or convert. Another participant, one of a handful of women at the convention who chose not to cover her head with hijab except during salat, suggested that members of the Muslim community often put what can be an uncomfortable pressure on her to wear hijab. Tensions were also clear when one woman was quick to observe that there were no female members represented in the AMT. She pointed out to the audience and members of the taskforce that it would be difficult for the AMT to achieve success in representing and helping to empower the American Muslim community if the AMT does not adequately reflect the diversity that exists within the community. Like any community, although American Muslims have much in common, there is also great diversity within in terms of opinions and perspectives and how this diversity is managed will shape the future of the Muslim community. Islam first arrived on the shores of North America centuries ago through the slave trade. Today, there are an estimated six to seven million Muslims in America, and the face of American Islam is continuing to evolve. It seems that post 9/11, the community has entered another phase, one that is continuing the process of change. Zahra explained to me that, “There is much more involvement and need for people to find a place to come and talk about stuff. People are more outgoing, especially after 9/11. I think it brought the community together,” she says. She gave an example of this renewed sense of identity and unity by pointing to the uptake of hijab. “Now everyone is wearing hijab,” she said. However, many also point to a splitting of the community, a splitting between those who are choosing not to maintain or adopt an obvious Islamic identity (what one participant termed an “identity crisis”) and those who are on another ‘extreme’, isolating themselves in response to the diversity around them. What people in the American Muslim community are talking about seems to be a divide that can often be categorized as one between liberal and conservative Islam. This sort of divide is one that has occurred and is occurring in many faiths post 9/11. Others at the convention were not as concerned with this divide and were focused more on discerning what it means to be an American Muslim today and working to shape that identity. Ingrid Mattson shared with the audience her opinion that what it means to be American is to appreciate kindness and reciprocate that kindness. She went on to acknowledge that while there are challenges in being a part of American society, such as confronting the excessive consumerism, there must continue to be gratitude for those opportunities that come with being American. On a similar note, Imam Siraj Wahhaj, a well-known Muslim speaker, discussed what he called America’s greatest strength: its freedom. He discussed how he thought American Muslims should manage this freedom and their Islamic identity by using their freedom for good rather than evil. 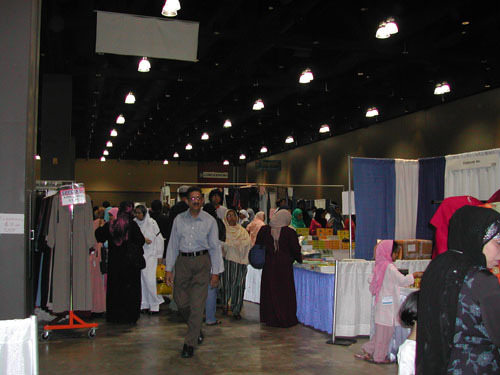 However one sees the community evolving and however one interprets what it means to be an American Muslim, one of the primary areas of focus for many speakers at the convention was the impact of American Muslims on American society. Sahar explained this concern. One of my former teachers taught me that if you’re in a land, you don’t say, “Oh, I’m just here as a visitor.” There’s no such thing as that. Every person that comes within a land impacts a land just as that land impacts them…So we need to be a part of it. We need to make sure that the impacts we are giving to the people, to the communities around us are positive ones. Nearing the end of the convention, participants were urged to take the knowledge they gained and the message of love for humanity home to create positive impacts in their local communities through, for example, political activism and service. Imam Siraj Wahhaj, among others, acknowledged that attendees of the convention came to be inspired and advised that it was now time to go home and act on the inspiration they had experienced – time to live Islam by loving humanity.